Is it that the record is more complete in later years or has activity increased? They don't provide the source in their tweet as you are able to read above, I would suspect it's from Budge an Long though. The Antarctic Iceberg Tracking Database. ... 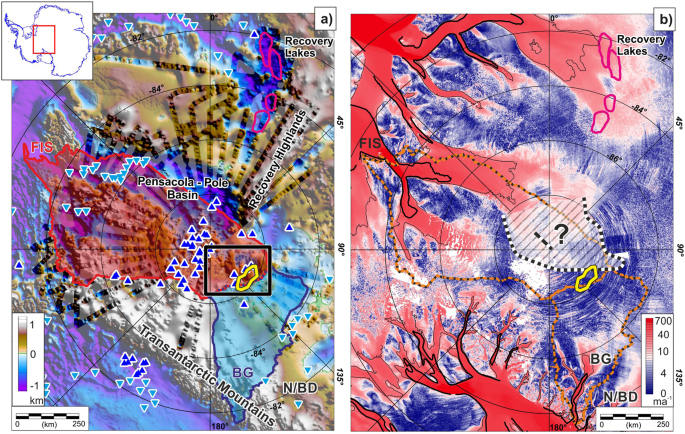 The internal layer draw-down, supported by the highly-reflective bed, points to active and significant basal melting in this region. ... "The process of melting we observe has probably been going on for thousands or maybe even millions of years and isn't directly contributing to ice sheet change. However, in the future the extra water at the ice sheet bed may make this region more sensitive to external factors such as climate change." Open Source: T. A. Jordan et al. Anomalously high geothermal flux near the South Pole, Scientific Reports (2018). "Massive Antarctic iceberg spotted on NASA Operation IceBridge flight"
3)Increased subsea (deeper than 400m) warming aroung AIS increasing basal melt. Unfortunately it seems CMIP6 does not include the effects discussed. could lead to further changes in simulated future climate [Refs. 8,36]." "Meltwater causes a reduction in global atmospheric warming, delaying the realization of 1.5 °C and 2 °C warming by more than ten years; it drives a northward shift of the ITCZ, which results in reduced drying over Northern Hemisphere landmasses and enhanced drying in the Southern Hemisphere; and it causes a large (up to 31%) increase in Antarctic sea-ice formation relative to the pre-industrial period and an increase in subsurface ocean warming around the Antarctic coast by a factor of four. 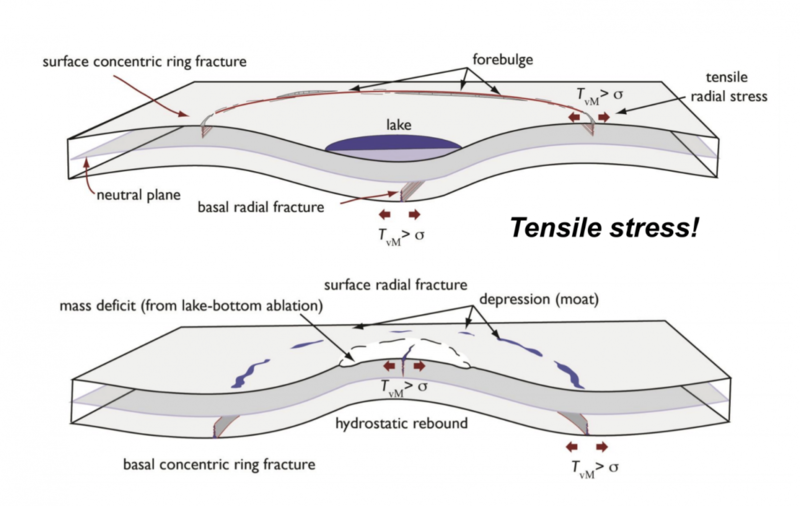 Our results suggest that a feedback mechanism is in operation, whereby the meltwater-induced subsurface warming leads to enhanced melting underneath ice shelves, potentially causing further meltwater-related climate effects. " Posted this in the Ice Apocalypse thread, but it belongs here too. East Antarctica has the potential to reshape coastlines around the world through sea level rise, but scientists have long considered it more stable than its neighbor, West Antarctica. Now, new detailed NASA maps of ice velocity and elevation show that a group of glaciers spanning one-eighth of East Antarctica’s coast have begun to lose ice over the past decade, hinting at widespread changes in the ocean. All the scientists say increased melt from the AIS will cause / is causing an increase in Antarctic sea ice extent. Up to 2014 the data supported this. Since then the data does not. I posted this on the Antarctic Sea Ice extent thread. At this moment in time the sea ice in Antarctic is falling to bits. "The reason for the layering is that global warming in parts of Antarctica is causing land-based ice to melt, adding massive amounts of freshwater to the ocean surface," said ARC Centre of Excellence for Climate System Science researcher Prof Matthew England an author of the paper. "At the same time as the surface is cooling, the deeper ocean is warming, which has already accelerated the decline of glaciers on Pine Island and Totten. It appears global warming is replicating conditions that, in the past, triggered significant shifts in the stability of the Antarctic ice sheet."" 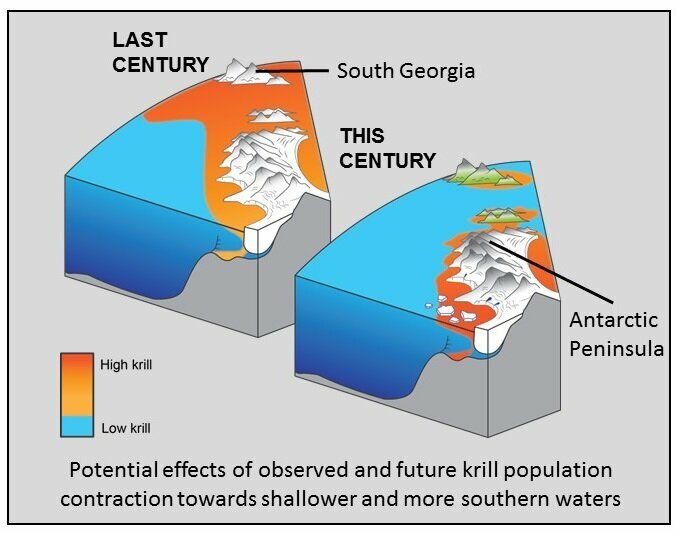 AGW is causing land-based ice to melt faster, adding massive additional amounts of freshwater to the ocean surface. You would think that cold surface water (also low salinity with a higher freezing temperature) would encourage sea ice freeze as winter approaches and discourage sea ice melt as summer commences. Since 1979 up to recently, there has been a slow but measurable increase in Antarctic sea ice extent (maximum extent in 2014). Hypothesis confirmed ? BUT since then the opposite. Antarctic sea ice extent is in decline, not just at max and min but during the melt season. Temporary aberration? Or is something extra going on? "Changes in sea ice significantly modulate climate change because of its high reflective and strong insulating nature. In contrast to Arctic sea ice, sea ice surrounding Antarctica has expanded, with record extent in 2010. This ice expansion has previously been attributed to dynamical atmospheric changes that induce atmospheric cooling. Here we show that accelerated basal melting of Antarctic ice shelves is likely to have contributed significantly to sea-ice expansion. Specifically, we present observations indicating that melt water from Antarctica’s ice shelves accumulates in a cool and fresh surface layer that shields the surface ocean from the warmer deeper waters that are melting the ice shelves. Simulating these processes in a coupled climate model we find that cool and fresh surface water from ice-shelf melt indeed leads to expanding sea ice in austral autumn and winter. This powerful negative feedback counteracts Southern Hemispheric atmospheric warming. 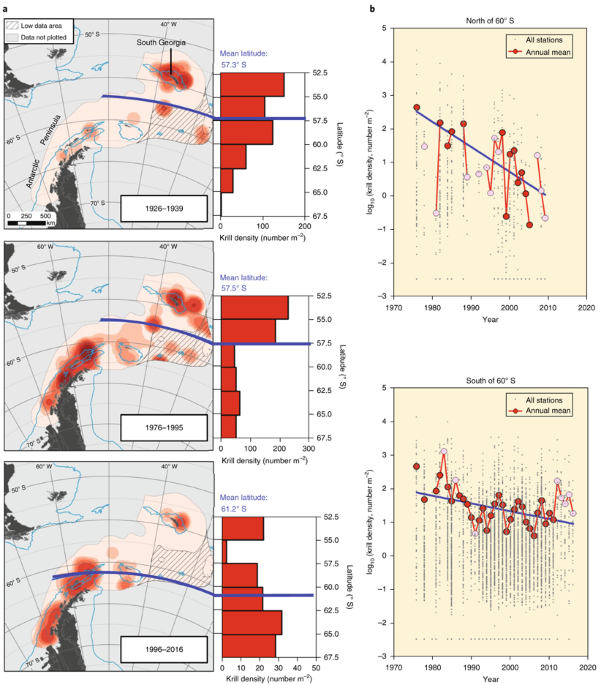 Although changes in atmospheric dynamics most likely govern regional sea-ice trends, our analyses indicate that the overall sea-ice trend is dominated by increased ice-shelf melt. We suggest that cool sea surface temperatures around Antarctica could offset projected snowfall increases in Antarctica, with implications for estimates of future sea-level rise. Two technicians performing maintenance at a U.S. research station in Antarctica died on Wednesday while working on a building that houses a generator for a nearby radio transmitter, the National Science Foundation (NSF) said. The pair, both employed by Virginia-based subcontractor, PAE , which provides logistical support to the NSF-managed McMurdo Station in Antarctica, were found unconscious on the floor of the building after a helicopter pilot flying over the area saw what appeared to be smoke coming from the structure and landed to investigate. Arlington, Virginia-based Pacific Architects and Engineers (PAE) is a subcontractor to Leidos, which bills itself as the prime contractor for the National Science Foundation's US Antarctic Program. After four days of troubleshooting components that sustained wear and tear from sitting through two winters on ice, the Subglacial Antarctic Lakes Scientific Access (SALSA) Drill Team began drilling the main borehole on the evening of December 23rd and reached the lake faster than expected at 10:30pm on December 26th with a borehole depth of 1084 meters. The drill team then reamed (smoothed and widened) the borehole so that instruments can be sent down. "Every 360 billion tonnes = 1 mm of sea level rise." The paper referred to in the Post article is open access. Agreed Sebastian , it is the time period of doubling as things do start to move pretty quick a few 'doublings' down the line! But this misses the point that this has been the 'Drip,Drip' losses prior to the start of 'Ice cliff Fracturing' denudation which will see mass losses shoot up overnight! Let's assume the amount doubles every 6 years. In the 30 years from 2017 to 2047 the cumulative melt would be 44.8mm or 4.48 cm, or 1.76 inches. In the 60 years from 2017 to 2077 the cumulative melt would be 716.8mm or 71.6 cm, or 28.2 inches, or 2 feet 4.2 inches. So from 2017 to 2047 sea levels would rise (from Antarctica alone) 1.76 inches, and from 2047 to 2077 sea levels would rise 2 feet 2.44 inches. That's quite a dynamic second 30 years. This would require the collapse of the WAIS beginning around mid-century. Thank you for doing this calculation. Yes, and it lines up neatly with ASLR's projection that the WAIS will start to disintegrate in the 2050s. But isn’t the big fear the Great Discontinuity, where a whole lot of ice areas begin similtaneous sudden collapse? Put two ice cubes in a box. Does one melt first then the other? No. There is a thermal link which sees both melt at similar rates. Doesn’t out atmospheric and oceanic circulation provide that same linkage, ensuring that most land-fast ice approaches the point of strucural failure at about the same time? While it is of significant concern about how fast sea level might rise, the other big fear is that we start something that will continue for centuries and has a large net sea level increase. Best estimates for Pliocene sea level, the last time CO2 was around 400 ppm, are around 20 m higher than modern. Can someone tell me what is happening here in the Amery Ice Shelf? Huge water ponds are forming despite the low temperatures (well below zero) on a white underground (low heat absorbing). Is this water coming from the mountains around? I think those ponds have formed in years past, they are meltwater possibly from foehn winds. Amery is one i watch closely. The thing is a dagger pointed into the heart of Antarctica. The danger is in the bed. The ice behind it has concave profile in elevation view as i have posted before, which has significance. Amery often grows large melt pools in January, with blue tints to the surrounding slopes (but snow reduces these signs, often starting by about Feb. 10?). The most melt was visible in 2004-6, 2015, 2017 and this year, so is quite variable. The front of the glacier has been advancing with no major calving for years. i've seen the ponds in recent years as you pointed out, but this year they seem to grow at a higher rate (?). I've also seen one article mentioning it was very big in 1988. I've also seen them getting brighter over time in recent years. The blue tint fades which i interpret as freezing again (at least on the surface). I'm failing in finding an article that tells me how this is happening. I would like to know the physics behind this because in freezing temperatures at a high albedo (fresh)water should not just melt, right? On the other hand i find a lot of info about how this is an implication for how the ice sheet might behave in the future. Melting snow and ice below freezing is nothing extraordinary at molecular level. Melting snow and ice is all about breaking bonds between water molecules. At 0°C and standard atmospheric pressure the individual molecules move or vibrate so much around that existing bonds break and not enough new bonds can form. Temperature is just a description of the average movement of the molecules. Some move faster and some move slower than the average. During noon the slopes of the Amery ice shelf get to around -5°C so not very far off from 0°C. Depending on the slope angle the surface also get's blasted with 700-1000W/m2 (during noon) of electromagnetic radiation from the sun which further increases the movement of molecules. Albedo is just an average of reflected vs absorbed energy for all molecules in an area. A single molecule doesn't have an albedo value. Either it get's hit and absorbs the photon's energy (followed by a quick re-release of the energy with a lower energy photon) or the photon misses the molecule. On a macro level snow can get down to an albedo of 50%, meaning it absorbs 300-500W/m2 while only losing maybe 100-200W/m2 to the below freezing air. Thank you so much Tealight! Yeah, makes sense. Looks like until now i haven't understood the albedo effect correctly. Need to read up on that. The results come from the Subglacial Antarctic Lakes Scientific Access (SALSA) project, which had previously announced that it would explore the water, called Lake Mercer, with a 60-centimeter-wide drill. There is another factor in the formation of melt ponds: snow absorbs near infrared better than visible frequencies, but both penetrate the surface. Thus, even if the surface is kept below freezing, the temperature just below the surface can reach freezing with melting beginning there. That melting darkens the snow and changes the albedo. Then a broader spectrum is absorbed, increasing the melt, as discussed by Tealight. that's interesting! Didn't know about infrared getting absorbed better. 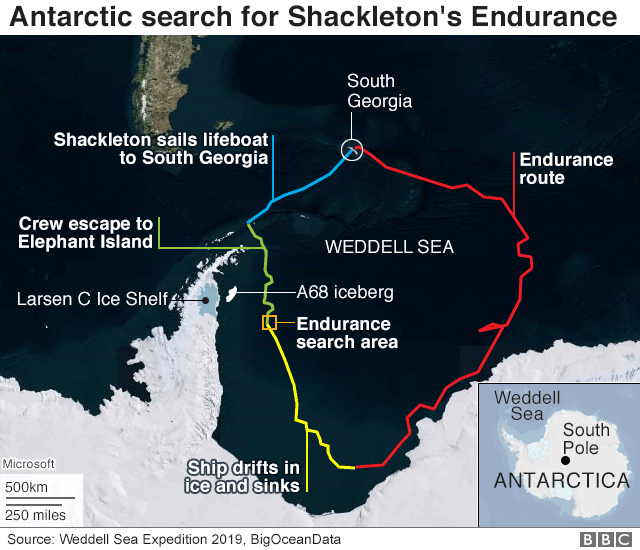 Antarctic explorers are to break their way through 75 miles of sea ice in an effort to reach the final resting place of Sir Ernest Shackleton’s ship, the Endurance, which sank to the bottom of the Weddell Sea in November 1915. ... “Just getting to the wreck site will be an exciting challenge,” Shears said. “We will need to break through about 120km of dense, thick pack ice, up to 2-3 metres thick. Scientists on the SA Agulhas II have spent the past two weeks collecting samples and surveying the area around the Larsen C ice shelf, where a trillion-tonne iceberg, A68, four times the size of Greater London, calved in July 2017. Closer to home - there were always some flies going round central light fittings at home when I was a kid, now - none! We did not see them disappear . 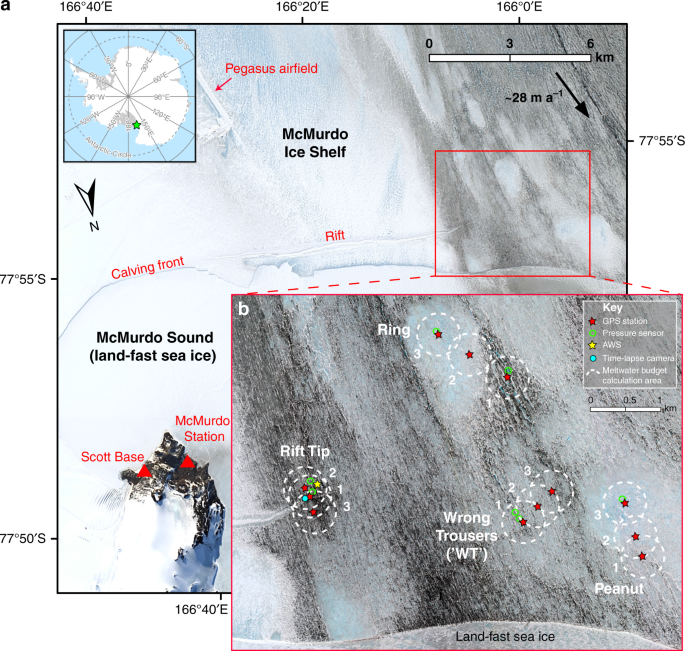 . .
""Huge cavity in Antarctic glacier signals rapid decay""
A few islands near the northern tip of the antarctic peninsular lose snow cover - while the rest remain white - why?. Elevation above sea-level as well as coastline topography may play a role among other factors ? There is a paper in cryosphere discuss by levermann and feldman based on a reductionist scaling approach. They find that Thwaites is more unstable than PIG, and i agree there, but think the method is too sanguine about Amery. I attach fig a1, because that depiction is one that i yearned for, but i have been too lazy to make myself. Really brings it home when you see that big red blotch of 3Km high ice behind Totten ... and it's all Volume Above Flotation. The islands are east of the Antarctic Peninsular, which means they are sheltered from the wet westerly winds and receive little snow fall compared to islands west of the peninsular. They are also in a good position to receive warm and dry from Foehn wind. Together with the fairly northern latitude is enough to keep the low elevation coastal regions from getting glaciated and become snow free in summer. But since they are so close to Antarctica snow can fall any time of the year. It really depends on the weather. The attempt this week to find Sir Ernest Shackleton's missing ship, the Endurance, has ended - without success. The team has now withdrawn from the area because of deteriorating weather and sea-ice conditions. ... "Like Shackleton before us, who described the graveyard of Endurance as 'the worst portion of the worst sea in the world,' our well laid plans were overcome by the rapidly moving ice and what Shackleton called 'the evil conditions of the Weddell Sea,'"